$10,000 mysteriously deposited; job promotion at twice the salary; $20,000 in debt disappears. 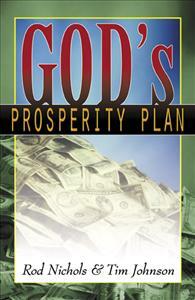 These are a few of the reports from people who have fully tapped into God’s Prosperity Plan. Would you like to have $10,000 appear in your bank account? How about a letter indicating that you own stock worth $30,000? Would you like to have a better job offered to you, where you would work fewer hours and make twice as much money? How about $20,000 worth of debt just vanish? These are the kinds of things that are happening to those who are tapping into God’s Prosperity Plan. This book lays out this powerful biblical plan for handling finances and reaping the many rewards that God promises in the Bible. It was to read God's Prosperity Plan! This book really opened my mind and heart as to the plans that God has for us. It really taught me about being obedient to God and helped me realize that everything we have is HIS! However, my husband has not read the book and is not in agreement about tithing. For me, it's something that seems natural to do but I was a bit worried about him not understanding so I'm just trusting God to change his heart and I started tithing. Since then my homebased business has really taken off. It's amazing the people He's leading to me. Another thing I've noticed are little things like prices of something I'm purchasing being lower than expected. Our company convention is coming up and I just didn't have the money for my ticket. My sponsor gave me the ticket because I hit the next pin level this month and she wanted to reward my efforts! My son asked me to order his contacts and I knew that we were short on money that week. When I went to order them I was writing out the check when they told me his eye exam was due next month and then gave me a trial pair to last him the month. I said "you mean I don't need to pay you" and she said "no mamam". I know that these are all gifts from God! He places people in our lives to share these gifts with us that are really from HIM! God get's ALL the glory, honor and praise!